When I wrote Project Nemesis it was a labor of love, more for myself than any kind of money-making career goal. I had no idea the the book would go on to become the bestselling original (not from a previously created character: Godzilla) kaiju novel ever, that the character, Nemesis, would be featured in a video game (Colossal Kaiju Combat: The Fall of Nemesis) or that it would attract a bevy of rabid fans creating fan art and fan fiction. I’ve been blown away by the response to my monstrous creation. So, it’s with great excitement, that I release the latest entry into the Kaiju Thriller genre, Project 731.Speaking of Kaiju Thrillers, how cool is it that other books are appearing with the “Kaiju Thriller” genre tag I created?! Not only am I thrilled to read more Kaiju books, but now I can take credit for coining the name for a new literary sub genre! Help Fund DUST, a Short Sci-fi / Horror Movie, on Kickstarter! 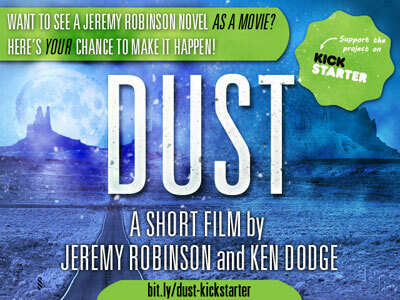 DUST is a short film being funded via Kickstarter and is based on my upcoming 2015 novel, THE DISTANCE. The film parallels the beginning of the novel, following Peter, a regular guy visiting with his parents on the eve of the world’s end. Except, for Peter, the night is just beginning. XOM-B… Robots and Zombies in a Post-apocalyptic future. Xom-B is one of those books that is hard to talk about without giving away too much. Even setting up the story has the potential to spoil things. What I can say is that it is a post-apocalyptic novel with robots…and zombies. Honestly, that’s all you really need to know, right?If not, here’s a little more. The pacing in Xom-B, as with my other books, is full throttle from beginning to end, but I have never had a more character-driven story (with the possible exception of Solomon/The Last Hunter). So, not only will you be able to enjoy the rapid-paced craziness of a post-apocalyptic survival story, but you’ll really care about this cast of characters and their fate. Read more on XOM-B… Robots and Zombies in a Post-apocalyptic future…. Coming Soon to a Bookstore Near You…The first half of 2014 revealed! 2014 is going to be an awesome, action packed year of full length novels, many of which (but not all) I am revealing the covers for. I’ve been in a cover design flurry for the past few days and am excited to share the results. But don’t just peek at the cover. There is also an announcement down at the bottom of this post. Also, fun fact, ALL of these covers were designed by me, even the Thomas Dunne book, which is super fun for me. First up, XOM-B! This is my next hardcover release from Thomas Dunne Books. It’s due out on April 29 and available for pre-order now!